The NEC SV8100 4-Port Analog Line daughter card PZ-4COTF mounts to the CD-4COTB Analog Trunk Card and is used when you want to connect up to 4 additional analog telephone lines (PSTN / CO's) to the SV8100 phone system. 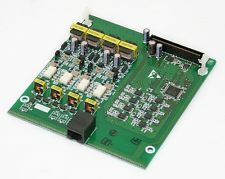 This card is one of the most popular ways to add further regular telephone lines to the NEC SV8100 telephone system in a gradual manner. By attaching the PZ-4COTF to the main 4 analog line card, it expands the SV8100 phone system with further 4 additional analog CO's.